Roughly two weeks earlier, Craig and his colleagues had received a similar summons from Governor Montagu Norman of the Bank of England who enquired if they were willing to embark on a top secret mission. Agreeing, the men were informed that their task was to shepherd the wealth of Britain to safety in Canada. The mission, code name “Operation Fish,” was a bold, but desperate, gamble by the British Government to protect the gold stored at the Bank of England as well as British-owned, marketable, foreign securities from a threatened Nazi invasion, ensuring that the country had the financial resources to prosecute the war from across the Atlantic, if necessary. Invasion was a very real possibility that mid-June 1940. German armed forces were on the Channel coast, after having brushed aside the British Expeditionary Force in Europe and crushed the French Army. Although more than 300,000 British and French troops had just been heroically and miraculously evacuated from Dunkirk, they had abandoned enough armaments to equip an army of ten divisions. The British Army was virtually powerless to stop an invasion. Britain’s European Allies were also faltering. Netherland and Belgium had already fallen to the Nazis, while France was on the point of capitulation, the German army having entered Paris on 14 June. To make matters worse, Italy had just entered the war on Germany’s side. It was not an easy decision to send all of Britain’s foreign assets to Canada. The only way to transport the tons of gold and securities was by ship across the U-boat infested, North Atlantic where 100 Allied and neutral merchant ships had been sunk in May 1940 alone. History was also not reassuring. During World War I, the SS Laurentic, carrying 43 tons of gold from Liverpool to Halifax, had been sunk in 1917 by a German U-boat off of Ireland. The loss of even one treasure ship would have major negative consequences. To buy weapons and other war materiel that it sorely needed from neutral United States, Britain has to pay in gold or U.S. dollars; no credit was permitted under the strict Neutrality Act in effect in the United States at that time. When storm clouds started to gather in 1938, the Bank of England decided to increase its gold reserves held at the Bank of Canada in Ottawa. 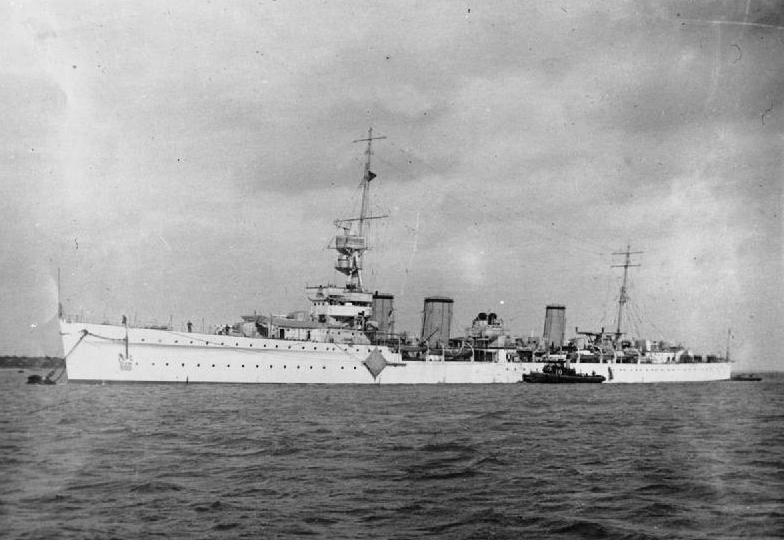 In May 1939, fifty tons of gold bars, then worth £14 million (roughly US$2 billion at 2014 prices), was brought over on HMS Southampton and HMS Glasgow. The two cruisers had escorted King George VI and his wife, Queen Elizabeth, across the Atlantic on their Royal Tour of Canada and the United States. A few months later after the outbreak of hostilities, a convoy of five ships, led by HMS Emerald captained by Augustus Agar, VC, DSO, each carrying £2 million in bullion, safely made its way to Canada. The Emerald made another “bullion run” in November 1939, as did other ships over the course of the next several months without incident. With the Emerald and others having successfully tested the waters, and the war situation in Europe turning grave, Prime Minister Winston Churchill gave the green light to “Operation Fish.” With speed of an essence, limits on the amount that could be sent on individual ships were discarded. The battleship HMS Revenge, accompanied by two converted liners, together shipped £60 million in gold to Halifax in early June. But the real “show” had yet to get underway. On 24 June, the Emerald, now under the command of Captain Francis Flynn, was sent to Halifax, packed to the gunnels with £30 million in gold bullion and £200 million in negotiable securities. The gold was stored in ammunition lockers, while boxes of securities were stashed in every conceivable nook and cranny of the ship, including covering the floor of the Captain’s day cabin on which Alexander Craig, the leader of the Bank of England team, had to make his bed. The Emerald crossed the Atlantic in a full gale. So bad were the weather conditions that its two accompanying destroyers were forced to return to Britain while the Emerald raced at full speed for Halifax. It arrived battered but safe on the morning of 1 July. It was met by the Halifax Agent of the Bank of Canada, a CN train, and a large armed guard. During the ship’s unloading, the perimeter of the dock was tightly sealed to prevent anyone getting a peek at its cargo. That night, the heavily-guarded train, stuffed with gold and securities, set off for Montreal where it was met by Sidney Perkins and David Mansur late the next day. In Montreal, the train was split in two, with the portion carrying the gold headed for Union Station in Ottawa to be meet by Bank of Canada personnel and armed guards for the short journey to the Bank’s headquarters on Wellington Street. The portion carrying the negotiable securities was unloaded at a secluded siding. In the wee hours of morning, with the streets closed to traffic, the precious cargo was delivered by truck to the Sun Life Assurance Company in Montreal. 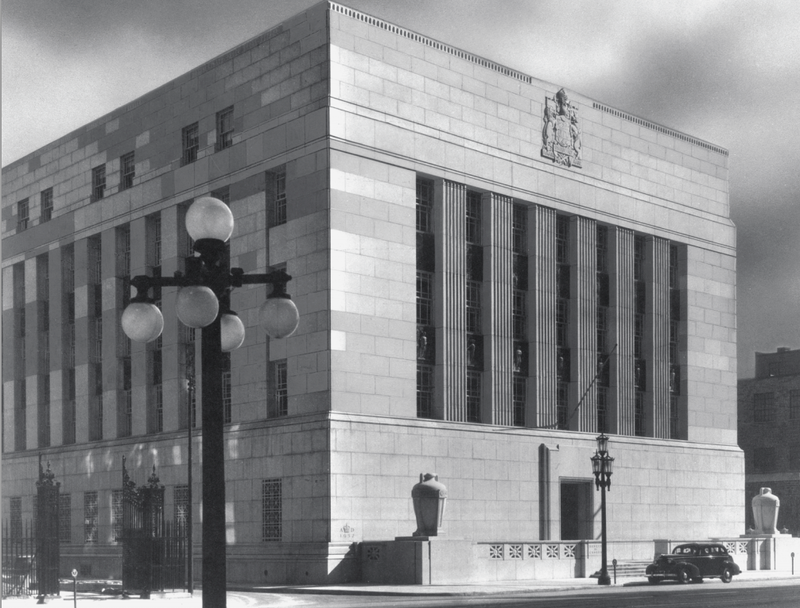 The Sun Life building, chosen earlier by Mansur to house the “United Kingdom Security Deposit,” was the only building with a large enough secure space to store the securities. A special, custom-built vault was subsequently built in its basement. To assist the Bank of England officials in checking, filing, and managing the securities, Mansur hired 130 retired bankers, brokers and secretaries and swore them to total secrecy. Although the UKSD remained in operation throughout the war, the 5,000 member staff of the Sun Life never knew what was going, or what was stored in the vault beneath their feet. A week after Emerald’s arrival, a convoy left Britain also bound for Halifax, under the command of Admiral Sir Ernest Archer. It consisted of the battleship HMS Revenge, the cruiser HMS Bonaventure, and three converted former passenger liners, the Monarch of Bermuda, the SS Sobieski and the SS Batory. On board these ships was a treasure trove of gold and securities, conservatively valued at £450 million, of which £192 million was in gold ($27 billion at 2014 prices). Again, the trip across the North Atlantic was difficult. The Batory developed engine trouble, forcing it for a time to come to a dead stop while repairs were made. In thick fog, it safely diverted to St John’s under the protection of the Bonaventure while the rest of the convoy raced to Halifax to be met by Sydney Perkins and other Bank of Canada officials. On board the Monarch of Bermuda was another precious cargo—refugee families evacuated to Canada for safety. Following the routine used previously, the gold and securities were unloaded, weighed and checked before being placed on a special CN train protected by more than 300 police and security guards. This was not an easy task as many of the bullion boxes and bags of gold coins had been damaged in shipment. Perkins later commented that “Seeing those tens of millions in gold piled up gave me a cold chill.” To speed up unloading and minimize the risk of detection, Perkins improvised a metal chute made from scrap metal sheeting to slide crates of gold from the ships’ deck to the quay. Once the train was loaded, and Perkins had officially taken delivery, it set off to deliver the securities to Montreal, and the gold to Ottawa. Again, the shipments were made without anybody outside the operation being the wiser; nothing was reported in the nation’s press. At the Wellington Street head office, bullion boxes came in so fast that Bank staff had difficulty finding places to store them. Crates waiting to be processed piled up in basement corridors and in the incinerator room, used for burning old paper money. Men laboured in twelve-hour shifts to unpack the gold bars and bags of coins and store them in the Bank’s 60 by 100 foot vault. Everything had to be meticulously recorded and accounted for. By the end of it, the Bank of Canada was the home to more gold than anywhere in the world outside of Fort Knox in the United States. The remainder of Britain’s wealth trickled in over subsequent months, with the redoubtable Emerald making yet another crossing in August 1940. In total, more than £470 million in gold was shipped from the Bank of England in London across the Atlantic to the Bank of Canada in Ottawa. (It value today would be about US$67 billion.) The value of the securities stored in the basement of the Sun Life building in Montreal was then estimated at £1,250 million, their value today, incalculable. Against all the odds, of the dozens of ships used to transport Britain’s wealth to Canada, only one, the merchant ship Niagara carrying £2.5 million in gold from New Zealand, was sunk. Its bullion was subsequently recovered. Despite thousands being involved in the mission, Operation Fish remained a secret until after the war. Bank of England, 194?. Unpublished War History, Chapter V, Gold, Bank of England Archives, http://www.bankofengland.co.uk. McDowall, M., 1997. Due Diligence: A Report on the Bank of Canada’s Handling of Foreign Gold During World War II, Bank of Canada, http://www.bankofcanada.ca/publications/books-and-monographs/due-diligence/. Naval-History.Net, 1998. Campaign Summaries of World War 2, German U-Boats at War, Part 1 of 6, 1939-40, http://www.naval-history.net/WW2CampaignsUboats.htm. Stowe, L., 1963. How Britain’s Wealth Went West, http://www.defence.gov.au/sydneyii/SUBM/SUBM.001.0323.pdf. Images, HMS Emerald, Imperial War Museum. Image, Bank of Canada, Associated Screen News, Bank of Canada Archives, PC 300-5-61. Reblogged this on The passage of my life….